This large condo in the Princeville Resort is privately owned. 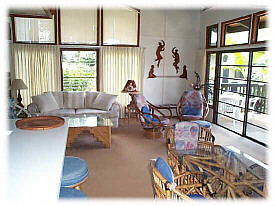 High vaulted ceilings and large windows bring in the brilliant island sun and balmy trade winds directly off the ocean. Tables and chairs on the large covered lanai are perfect for outdoor morning coffee. This townhome-style condo is very comfortable and convenient to all activities. Often used as a honeymoon retreat, this condo is also perfect for families or groups of up to 6 to spend a few days to a whole month on the magical Garden Island of Kaua'i. Relax in the comfort of home - at a reasonable price. Ocean location and small town location. $145 - $175 per night. 7th night and 4th week free. All rates plus Hawaii State taxes and out-clean charge. 20% deposit required to confirm reservation. Payment in full required 30 days prior to arrival.